I'm with you girls makes no never mind to me. That boy could go totally bald and he'd still be one of the sexiest men around. He has no interest in the "beef cake thing"
It's hard to find pictures of him cuz he just isn't about that. His soul is in his eyes. Two pictures which have not been on this thread and which I have not been able to find on the Internet, anywhere, despite months of searching. They were published in the New York Times magazine on Feb 19, 2006. I didn't want to rip the magazine apart to put the pictures through the scanner. I finally persuaded my husband to take a picture so we can all enjoy. Oh, in case you can't tell, that is a pacifier that Michelle is holding in her hand. Thanks so much for those NYT pics, Vicki. I looked around for them, too, and wondered why no one had posted them. 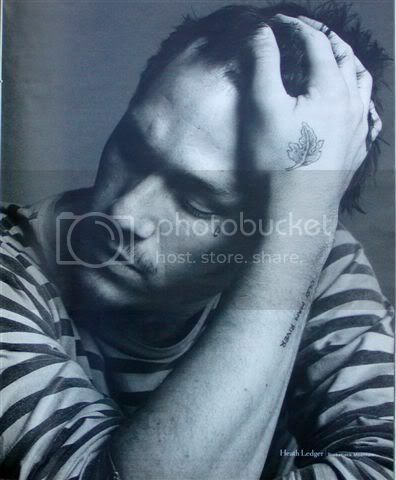 At the time, I thought the photographer had added Heath's tattoos, but now I know they're real (except the tear). Ruby, that's a great list. I agree totally! Hmm, if I've anything to add, it would be that Heath is always truthful, in life and on screen. And if his soul is in his eyes, his heart is in his smile. I have this pic! I have this pic! !